September 11, 2011 –Reno, NV: Despite rumors of the hardest Ultra4 course in history, all fifty starting positions for the 2011 Ultra4 Torchmate Reno Stampede were filled months before the green flag dropped. Now in its second year, the Ultra4 Stampede covered 128 miles of loose hill climbs, technical rock canyons, and wide open deserts at the Reno Tahoe Motorplex about 20 minutes outside of downtown Reno, NV. The racing was intense early on as Shannon Campbell, Jason Scherer, and JT Taylor battled for the lead in their V8 powered, 4-wheel drive Ultra4 cars. Mechanical issues hampered Campbell and Scherer, leaving JT Taylor to take the win in his innovative Torchmate-built twin traction beam race car. The brutal course took its toll on competitors, with only 17 of the 50 drivers completing the 128-mile course within the allotted eight hour time limit. Pennsylvania’s Erik Miller finished second to Taylor, with Ultra4 veteran Randy Slawson in third place in his Bomber car. Please see the entire list of finishers below. 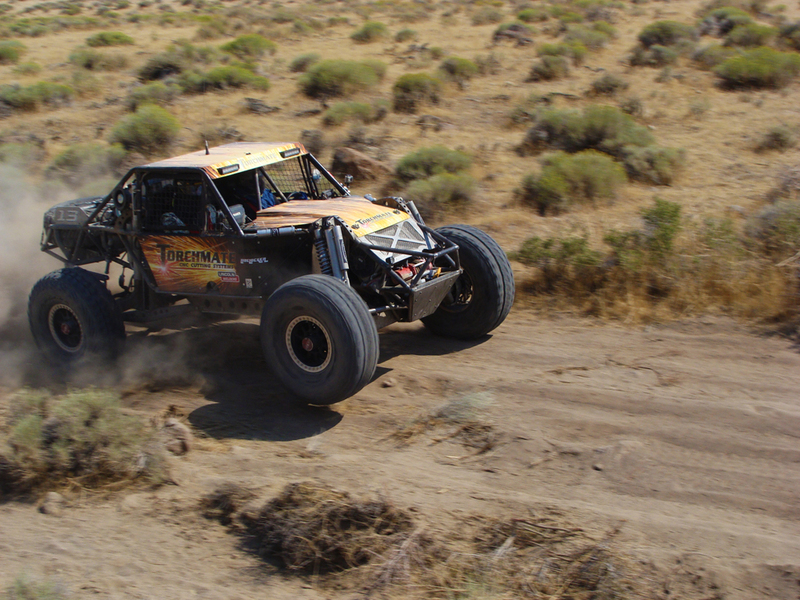 In addition to purse money, Ultra4 drivers were also racing to secure a sport in the 2012 King of The Hammers. 7 drivers earned spots after this weekend’s event. The final Ultra4 event of the season takes place at historic Glen Helen Motorsports Park in San Bernardino on October 22nd. The points race has tightened after the Torchmate Ultra4 Stampede and the season title is on the line at Glen Helen, where a two hour Grand Prix will decide who is the 2011 Ultra4 champion. About Ultra4 Racing: Due to the incredible success of the Griffin King of the Hammers, Hammerking Productions created the Ultra4 racing series. The defining characteristic of this class is that all cars must possess 4-wheel drive. Beyond that, the class is unlimited and combines multiple off-road disciplines such as desert racing, rock crawling, and short course racing. The Griffin King of The Hammers takes place each year in February, on public lands in Johnson Valley, CA. The race has evolved from 12 teams racing for bragging rights and a case of beer, to more than 150 teams competing before tens of thousands of live spectators and hundreds of thousands of online fans.